A day in the life of Night Call—Matt Hawkins, vampire-slayer extraordinaire and Mercy Belique, vampire femme fatale. From the whacky, to the mundane and back again in twenty-four hours. After successfully completing one job--killing the angry, ugly rat thing was the aim after all, no matter what else may have gone wrong... er, happened--Matt Hawkins settles in for a nice, quiet day at home. If you ignore the neighbour trying to come to terms with his new boat. And the ringing phone. Matt does neither. The former brings him some satisfaction and the latter, a new job. Which is all well and good, until he actually gets to the local waterway and comes face to face with a creature he's never seen before. 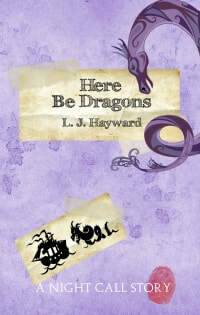 Navigating between cranky scholars, moody vampires and a monster straight out of myth, Matt might just find himself in uncharted waters and “Here Be Dragons”.